I am sure many of you who have children experience the repetitive requests that they have on a daily basis. In our home, it either has to do with snacks, movies, tv shows, or books. Each night we have a routine where we sit down and read together before bed. I have a special library books bin that they get to choose one book from. I often have to make them rotate the books that we read each night because if they had their way, they would read the same book over and over again. We have not been to the library since school started, so we have been reading our own books right now. We do have a good selection, but for some reason my kids insist that I read their favorite: “Go, Dog. Go!” by P.D. Eastman. At first I really enjoyed the book, because it is actually one that was read to me as a little girl. It is definitely a classic. I was checking out the copyright in it and it says copyright 1962. 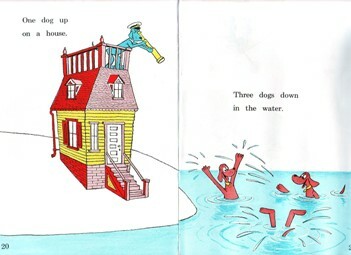 I decided to look up a little info about this book and I wound up coming across this great video where someone put the Go Dog Go story into a video format and narrated it. Apparently they did it for their son. I think it is really great and I can’t WAIT to show my kids! So, how about you and your kids? Any favorite classic books that you enjoy reading together? And if your kids are already grown, do you remember a favorite book that they had that they would make you read over and over? I would love to hear!